The view from the east of the Golden Temple, or Harmandir, in the city of Amritsar. 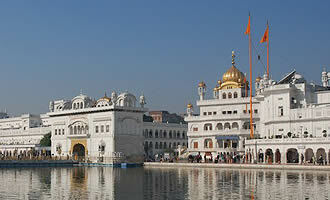 Sikhism's holiest place of worship is the Golden Temple, or Harmandir, in the city of Amritsar. Located in the state of Punjab, the city, established to be a place of pilgrimage, derives its name from the sacred tank, or pool, called the Amrita Saras (pool of nectar), where the temple was built. Guru Ram Das, the fourth of the ten Sikh Gurus (spiritual guides), oversaw the construction of the tank and the settlement that grew around it, which was completed in 1577. His successor, Guru Arjan, the fifth Guru, erected a modest temple on an island in the center of the tank along with the causeway used to reach it and installed the Sikh holy book, the "Adi Granth," in the shrine in 1604. The Adi Granth is displayed in the Golden Temple each day, and then transported back to the Akal Takht each evening. The temple was destroyed several times by Afghan invaders, but reconstructed in the 1760s. Its present appearance is due in large part to the patronage of Maharaja Ranjit Singh, the Sikh ruler of Punjab in the early part of the 19th century, who financed the gilding and other enhancements. 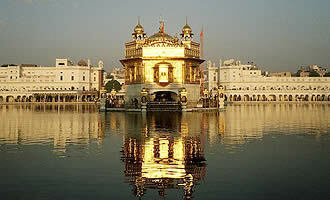 Since then, the building has come to be familiarly known as the Golden Temple. Amritsar was also the location of the 1919 Amritsar Massacre during the struggle for independence. 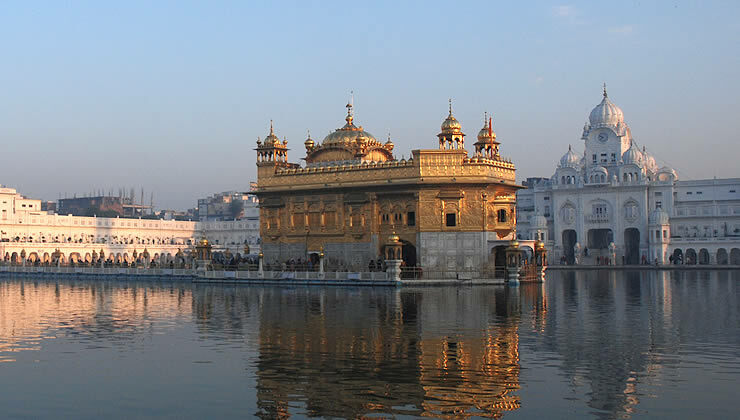 "Golden Temple" is the name of Amritsar's hallowed Sikh shrine and the religious complex where it's located. The shimmering two-story temple sits atop a square platform in the center of a man-made tank, called the Amrita Saras (pool of nectar). The lower story's marble walls are decorated with inlaid flower and animal motifs, while the upper story's inner and outer walls and roof are sheathed in gold leaf. The roof includes four small kiosks at each corner and is crowned by a central dome shaped like an inverted lotus. The temple's gilding was completely replaced in 1999, but high pollution levels are continuing to erode the gilt. The temple is reached by passing through an archway on the complex's western side, the Darshani Deori, and crossing a nearly 200 foot walkway called the Guru's Bridge. The shrine has four entry points, which are placed at the same level on each side and signify the faith's openness to people of all religions. The inner sanctum holds the Sikh holy book, the "Adi Granth," which contains 6,000 hymns and was compiled by Guru Arjan. The book is stored in the adjacent Akal Takht overnight and brought to the shrine early each morning; its hymns are recited continually throughout the day. How do Sikhs show the importance of the Sikh holy book, the "Adi Granth"? What traits does Sikhism draw from Hinduism? Islam? Compare the basic tenets of Sikhism and Akbar’s universal religion. Can you make a connection between the two?